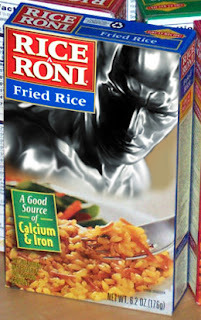 Riiiiice a Roni the superhero treat! Good source of Calcium and Iron?! Shouldn't it be good source of Silver and Power Galactic? Yeah I gotta admit I was a bit lazy with the photoshopping on the box.